I’ve had my ups and downs with NYX recently. I found their Dream Catcher Palette in Golden Horizons underwhelming but fell head-over-heels with their HD Studio Finishing Powder. I am sat here fizzing away with jealousy over the fact NYX counters seems to be available up and down the country but unfortunately, nowhere near me. 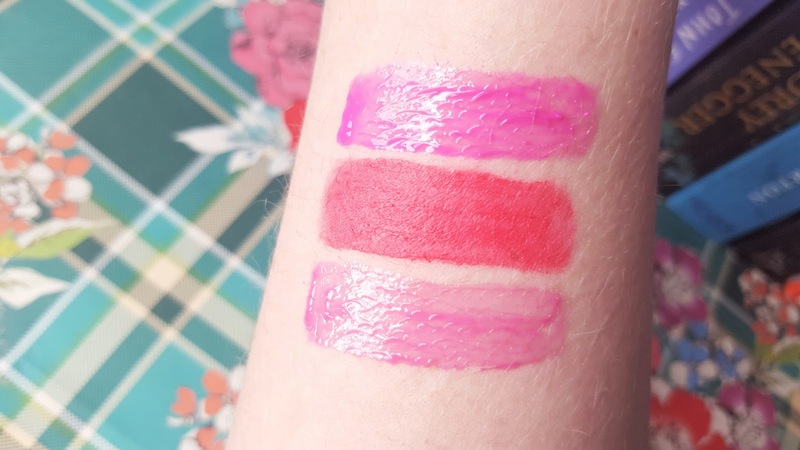 I received two shades from the NYX Butter Gloss collection at Christmas in the adorably named shades Strawberry Parfait (BLG01) (below, bottom swatch) and Sugar Cookie (BLG19) (below, top swatch). Both shades are incredibly similar although Sugar Cookie is brighter with purple undertones. Both shades sit nicely on the lips, give a beautiful shine and aren’t overly sticky. They lasted for around 3 hours on my lips without needing a top up. My Soft Matte Lip Cream in Antwerp (SMLC05) (above, middle) is my favourite of the three, however, as beautiful as this shade is, I found the swatches provided on Feel Unique a little misleading. I was hoping for a more muted rose colour similar to my Sleek Matte Me in Petal, what I got was a bright red/peachy shade that is a little too eye catching for everyday wear. That being said I am seriously impressed with the longevity of this product, it almost acts like a stain. I didn’t find the formula as drying as other matte finishes I’ve tried in the past and it applied with a beautiful even coverage. I’m hoping to pick up Stockholm and Buenos Aires in the Matte finish during my next haul and Creme Brulee and Apple Strudel from the butter gloss collection. 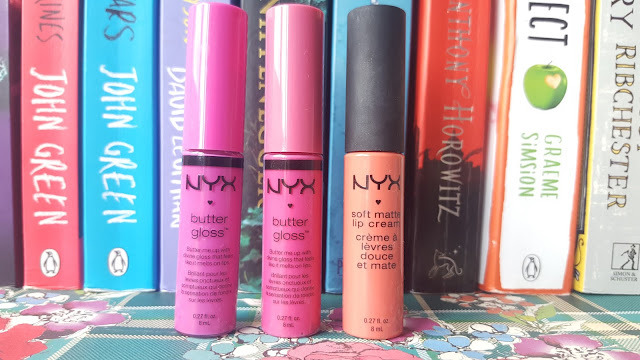 The NYX Butter Glosses retail for £5 each while the Soft Matte Lip Cream collection retails for £5.50 each. Both are available in selected shades at Boots, Selfridges and Feel Unique. What’s you favourite shade out of the three above? Do you prefer a glossy or matte finish? Do you own any of the Butter Gloss or Matte Lip Cream collection? "The Body Shop Lightening Shade Adjusting Drops Review"
"Makeup Geek Blush Pan in Head Over Heels Review"